motifdeveloper.com Q & A - How do you use the XmComboBox Widget? How do you use the the XmComboBox Widget? A ComboBox is a component which combines direct Textual user input with the convenience of List selection. Generally, the component presents itself to the user as a TextField of some description, with an ArrowButton to the side of the Text. The user can either type into the Text component, or press the ArrowButton, which results in the popping up of a List of available items from which the user can select using the mouse. 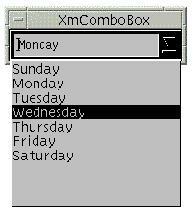 Figure 1 displays a typical ComboBox, configured to allow the user to select from the days of the week. ComboBoxes are components which are compact in terms of screen usage. Unlike a simple List, they occupy only sufficient space on the screen in order to display the current selection. ComboBoxes are however associated with only a single selection at any given time. If multiple choices may be made from a set of items, the List remains the correct interface paradigm for the programmer to adopt. Given the task of presenting a set of choices to the user, whilst at the same time minimizing the screen space required for the task, the ComboBox is the natural component. Where a ComboBox might not be preferred over other components depends on the nature of the data. If the set of choices is prohibitively expensive to calculate, or the set is fairly large, it might be better to simply present a TextField to the user; navigating through a particularly large set of items in a popup List is not a very pleasant user experience, and should generally be avoided. A secondary consideration is whether the data to be presented forms a natural, closed and ordered set. If this is the case, a SpinBox component also comes into consideration; where the data is in any way unordered or arbitrary, the ComboBox is to be preferred. Where the data forms a small set, there is little to choose between the two components, ordered or otherwise. The component displays a popup list of available choices on request. Figure 2 displays an Drop-Down ComboBox, after the user has pressed the Arrow, so that the popup List is visible. This component also displays a popup list of available choices on request; the difference is that the TextField which displays the current choice is read-only. A Drop-Down List has identical appearance to a Drop-Down ComboBox. The component displays the set of available choices in a permanently visible list, placed underneath the TextField. Figure 3 is a sample ComboBox style. Programmers wishing to use the Motif ComboBox should include the file <Xm/ComboBox.h> in their sources. The header file declares the XmComboBoxWidget and XmComboBoxWidgetClass types, as well as providing functional prototypes for all the XmComboBox convenience routines, which are listed below. The class pointer is xmComboBoxWidgetClass. Although the widget inherits via the Constraint class, XmComboBox does not define any new constraint resources. Note that the wildcard specification (*) is required before the internal List name, because as already discussed, the ScrolledList may not be an immediate ComboBox child. Whether fetching the internal components of the XmComboBox is really necessary from the general programming perspective is a moot point: the XmComboBox implements what is termed a mirror, whereby resources which normally would need to be applied to sub-components can be applied directly onto the XmComboBox itself. Note that the ArrowButton which the XmComboBox component creates in order to facilitate popup of the List is a hand-drawn artifact, and not a real sub-component. So while it is possible to configure the built-in Text and List components of the ComboBox to whatever style the programmer requires, configuration of the ArrowButton is strictly limited by the interface which the XmComboBox directly presents to the programmer. An XmComboBoxWidget can be created in a number of ways, either using generic Xt Intrinsics methods, or by utilizing a Motif convenience routine defined for the purpose. ** Specimen arguments for the widget. See Resource Table below. Ultimately, the Motif convenience creators are mapped down onto Xt Intrinsics methods in any case; these Xt methods can always be called directly as an alternative. Note that if you use the generic Xt mechanisms, you must explicitly specify the type of ComboBox if you want a Drop-Down ComboBox or Drop-Down List style. This is implicitly set if you are using the Motif convenience routines, but must be explicitly stated here. More information on the various resources supported by the XmComboBox widget is given in the resource table below. The geometry management associated with an XmComboBox is minimal: its layout of the constituent List and Text components is very basic, and so there is no reason why an XmComboBox cannot be instantiated in the managed state (XtCreateManagedWidget(), ...). As a general rule, geometry managers should be managed bottom-up after their children are all managed, in order to avoid explosive geometry management effects. Here, since the XmComboBox is not acting as a general purpose layout manager, the performance side effects are minimal. The Following table lists all the resources associated with the XmNcomboBox widget, specifying for each the class, type, default value, and get/set access status. Specifies the size of the drawn ArrowButton which the user "presses" to display the popup List of items. The default value depends on the size of the TextField. Specifies the horizontal distance, measured in Pixels, between the drawn ArrowButton and the built-in TextField. A "mirrored" resource, this specifies the number of columns to display in the built-in TextField. The List is permanently visible, and the TextField is editable. The List is hidden until required, and the TextField is editable. The List is hidden until required, and the TextField is read-only. Specifies the font used for the List items, and the TextField. The XmFontList type is considered deprecated from Motif 2.0 onwards; although maintained for backwards compatibility, the XmRenderTable is now the preferred way of specifying compound string appearance. Specifies the thickness of the rectangle used for highlighting the XmComboBox widget. The default value depends upon the XmDisplay object XmNenableThinThickness resource. If this is True, the default is 1, otherwise 2. Specifies the number of items in the XmComboBox internal List. The resource must be used in conjunction with the XmNitems resource. Specifies the set of items in the XmComboBox internal List. This resource is represented by an array of compound strings (XmString). Specifies the widget ID of the internal List widget associated with the XmComboBox. This resource is read-only: applications cannot change the List component associated with the XmComboBox. The programmer can however fetch the value in order to perform direct operations on the internal List when required. Specifies the minimum vertical spacing between the XmComboBox top and bottom edges and the internal List and Text components. Specifies the minimum horizontal spacing between the XmComboBox left and right edges and the internal List and Text components. Selected positions are reported with the first List item at position zero. Selected positions are reported with the first List item at position one. Note that this resource only affects callback reporting, and the interpretation of the XmNselectedPosition resource. Inserting or selecting items using the Motif convenience routines XmComboBoxAddItem(), XmComboBoxSelectItem(), and XmComboBoxSetItem() (see below) always assume that the List has the first item at position 1. Specifies the render table used to render both the internal List and TextField components. If unspecified, this will be inherited from a BulletinBoard or VendorShell ancestor. Any render table specified will take precedence over any XmNfontList resource. Specifies the currently selected item associated with the XmComboBox. It is represented by a compound string (XmString). Specifies the position of the currently selected item within the internal XmComboBox List. Interpretation depends upon the value of the XmNpositionMode resource. Specifies the widget ID of the internal TextField component of the XmComboBox. This resource is read-only. Specifies the number of visible items in the XmComboBox internal List. Setting this resource may affect the height of the List widget, and hence the XmComboBox itself if the List is configured to be permanently visible. XmComboBoxAddItem() adds the specific item to the List component of the XmComboBox widget at the specified position. A position of 1 represents the first item of the List, 2 inserts at the second position, and so forth. A position of zero appends the item onto the end of the List. If unique is True, the item is only inserted if it does not already appear in the XmComboBox List. The item parameter is a compound string (XmString): this should be constructed using a standard XmString routine such as XmStringCreateLocalized(), XmStringGenerate(), and so forth. The XmComboBox takes a copy of the supplied item (or rather, the built-in List component does, through the routine XmListAddItemUnselected()), and so the programmer should reclaim the utilized space associated with the item by calling XmStringFree() at an appropriate point. XmComboBoxDeletePos() removes the item at the specified position from the internal XmComboBox List. The first item in the List is at position 1, the second item is at position 2, and so forth. The last item in the List can be removed by specifying zero as the position parameter. Note that if no item exists in the XmComboBox List at the specified position, the Motif toolkit automatically raises an error using the XmeWarning() routine, which maps onto XtAppWarningMsg(). By default, this will write a message to the standard error output, unless the programmer has installed a customized Xt warning handler using the routine XtAppSetWarningMsgHandler(). XmComboBoxSelectItem() selects the first occurrence of the specified item in the XmComboBox internal List. If the specified item is found within the List, it also automatically replaces the value in the XmComboBox TextField. Just as XmComboBoxDeletePos() raises an error if the parameters to the routine are invalid, so does XmComboBoxSelectItem() if the specified item is not found within the current internal List item array. The item parameter is a compound string (XmString), which should be constructed through the standard XmString routines such as XmStringCreateLocalized() or XmStringGenerate(). It is the responsibility of the programmer to reclaim the utilized space associated with the item by calling XmStringFree() at an appropriate point after XmComboBoxSelectItem() has been called. XmComboBoxSetItem() is almost identical in behavior to XmComboBoxSelectItem(); the difference is that XmComboBoxSetItem() also ensures that the given item is also visible in the internal List. If item is at a position greater than the XmNvisibleItemCount resource of the XmComboBox widget, the item becomes the first visible item in the List. XmComboBoxUpdate() updates the XmComboBox widget so thai it is synchronized with the state of the internal List component. This would be required where the programmer decides to manipulate the contents of the internal List directly, rather than using XmComboBox convenience functions and resources. In particular, the XmComboBox XmNselectedPosition, XmNitems, and XmNitemCount are recalculated from the internal List, and used to reset the XmComboBox selected item where appropriate. Note that only the routine XmComboBoxUpdate() was defined for Motif 2.0: all the other convenience functions are Motif 2.1 specific. The reason field will always have the value XmCR_SELECT for an XmComboBox callback. The event field is a standard X description of the event which triggered the callback. The item_or_text field is a compound string (XmString) which represents the new selected item in the XmComboBox widget. This element of the structure is temporarily allocated by the Motif toolkit for the duration of the callback - if the programmer wants the value cached and utilized outside the scope of the callback, the application should copy the value using XmStringCopy(). The item_position element specifies the index of the selected item within the internal List. The interpretation of the value depends on the XmNpositionMode resource of the XmComboBox. If this is XmONE_BASED, the first item in the List is assumed to be at position one; it is possible for the toolkit to report an item_position of zero in these circumstances, and this situation corresponds to the case where the user directly typed a new value into the XmComboBox TextField rather than selecting from the List of choices. If this is XmZERO_BASED, the first item in the List is at position zero. If we follow on from the previous paragraph, it means that an item_position of zero is now ambiguous: it is not possible to distinguish between List selection and TextField direct entry in this mode, just by inspection of the callback data. 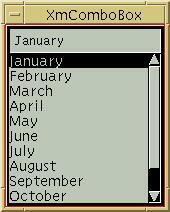 As an example, consider the simple task of presenting the user with a set of Month names from which to select. MonthComboBox_stubs.c - selection callback code which prints out the current selection of the ComboBox as it is modified by the user. Makefile - a general purpose Makefile for the application. This is configured for Solaris, although you will need to get hold of something later than Solaris 2.6 as this is a Motif 1.2 platform. At the top of the file are rules for various platforms: simply comment out the Solaris section, and uncomment your platform as required. MonthComboBox.xd - the X-Designer design save file, created with version 6 of the product. Feel free to ignore this: the source codes can be read without the use of the GUI builder. Alternatively download a tar archive, MonthCombopBox.tar, of all the above source files. If you are using Netscape Navigator you may have to hold down the Shift key when you click on the file name in order to ensure that you are prompted to save the file. The XmComboBox style, as indicated by the XmNcomboBoxType resource, is a create-only attribute. This means that the style of presentation is fixed once the component has been instantiated into the program. Unfortunately, the default value of XmNcomboBoxType is XmCOMBO_BOX, which is the permanently visible List arrangement. This means that an XmComboBox, created using default values and standard Xt Intrinsics creation routines, differs from the normal understanding of how a ComboBox should look and feel. The default XmComboBox is not really a ComboBox at all; for proper ComboBox behavior, the correct convenience routine must be called, or the style explicitly coded. This is probably a minor technical mistake; the default style can already be obtained out of standard components in any case. A companion Motif 2.1 Programming Manual has been prepared for O'Reilly. This last volume is Motif 1.2 specific, although the general techniques which are described remain invaluable, irrespective of the version of the toolkit you are using.